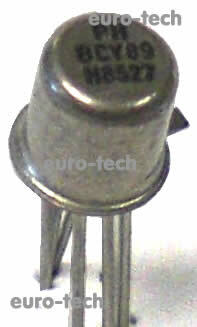 The BCY89 series of metal can IC's from Philips Semiconductor. Available from Euro-Tech stock is part number BCY89, BCY88 & BCY87 integrated circuits from Philips. Matched dual NPN transistors in a TO-71 / SOT31 metal package. Divided into 3 types according to their matching accuracy. BCY87 and BCY88 are intended for use in low offset, low noise, low drift differential amplifiers. BCY89 is intended for use in second stage of differential amplifier or for more general usage. Available from stock in our UK warehouse, these products are becoming increasingly difficult to source. Quantity: Currently 590 Pieces available from our UK stock warehouse. A full data sheet for BCY89, BCY88 & BCY87 is available to download here.